Awhile back my daughter's preschool teacher made "clean mud" with the class and while talking about it she mentioned to me that I should put Ivory soap in the microwave & see what happens! She did not mention what actually happens but I kept the tidbit in my mind hoping to test it out at a later date. Mad Science Week brought the idea to the forefront of my mind & I figured it was a great time to try it and see what happens. I am so glad I did! The ivory soap produced quite an unexpected & amazing reaction! now you have 4 quarters of the soap. 3. Put 1/4 piece of soap bar into microwave & heat for 1-2 mins. Note: I put it on a paper plate to minimize the mess/clean-up. The reaction happens quickly so watch it & stop when appropriate. I think it took about a minute, definitely less than two. Of course we repeated the above with all 4 pieces. we had to explore it through smell, touch & play! they wanted to add water to see if they could make snowballs. I obliged and gave them a cup of water to pour in as they wanted. & they were able to form a "snowball-ish" type ball. The more water they added, the more the initial foam "melted". After adding in the entire cup of water we were left with lots of suds. They finished by playing with the suds for awhile which they enjoyed. They had super clean hands at the end of it all! 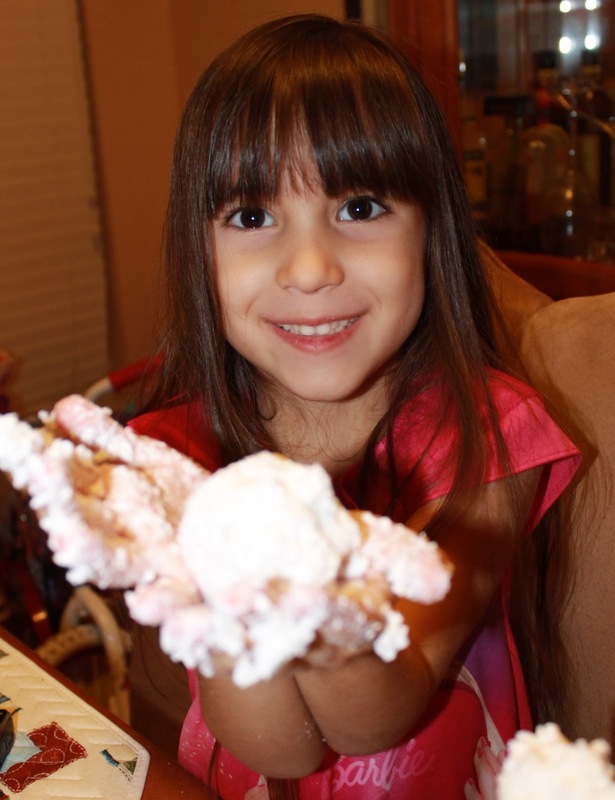 Who would have thought a bar of Ivory soap could be so fun? How fun! My kids would love this-thanks for sharing. I better add ivory soap to my shopping list. they will get a real kick out it & it's "clean" fun! A win-win for sure. It's such a fun & easy one to do at home! I love this. Do you mind if we do it in a few weeks and link back to you? loved seeing all you did with it. That is so awesome. I will definitely have to try this. live in Australia and don't think we have ivory soap. would any soap do? I've seen this a couple of times and every time I think: "I need to do this." I've got several bars of soap sitting in my cabinet for just this type of thing. Super cool! I can't wait to do this!! Thanks! Oh my what good clean fun (sorry couldn't resist the pun). Didn't know that soap did that! This looks like so much fun! I need to get some ivory soap next trip to the store!! Stopping by from TGIF. Love how you played with it in water too! You are such a fun mom! Thanks so much for sharing this with us on Sharing Saturday :) Hope you have a great week and looking forward to seeing more of your posts. Just pinned it to do with my 4YO - can't wait, we happen to have lots of soap! You piqued my curiosity, though - what's "clean mud"?? Does any brand of soap work or must it by Ivory? I've got a few hotel soap bars that might be the perfect size. Thanks! Found this on Pinterest. I happen to have an extra bar of Ivory sitting in the laundry room. We will do this tomorrow! This is so cool! I wanna do myself, never mind the kidlets ;) Can't wait to try this!! Our soap didn't work, but burnt. Not sure if its the microwave or the soap. I guess half of the experience is when it fails! Ack! I saw this on another website and tried it for my bored little ones this past week. I didn't think about cutting it into pieces! LOL You're right, it does make a mess! (But i had a really clean microwave! LOL) It's kind of like the snakes that we get on july 4th. Any idea if it works with different soap? Question for all of you who have tried this: does it make everything you cook in your microwave afterwards taste like soap? Jenny, I cleaned my microwave after and since we used small pieces we didn't get anything around the microwave and I never had anything taste funny. Hope that helps. please be warned! let it sit for a few minutes to cool in the microwave! i did not and burned my finger BAD! my entire finger was one giant blister! i did this about a week and a half ago and its still healing. just be careful not to burn yourself!!! 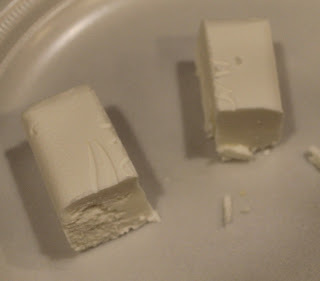 I tried this with a small piece of soap (just a generic white bar soap), i put it in for only 30 seconds (on a plate). My microwave started smoking and almost caught on fire, plus the soap just melted did not foam up at all .. what went wrong? Every time I've seen this project discussed, Ivory soap is specified. I don't think it will work with just any soap. Needs to be Ivory. We used to do this, as children, and also for Christmas we would construct a candle chimney, squares of parafine stacked, and then whip with an old egg beater some parafine for a snow cap on the top of the chimney. The chimney was red, and we would scroll in lines to look like bricks. It is always fun to play, and be creative. EggMama, sorry you had such an unpleasant experience. The experiment definitely calls for Ivory Soap which is not strong smelling at all as it is unscented. We had no problems when we used that specific soap which is why we shared it with the specific brand mentioned. I don't know of other soaps that work like it. "Ivory soap is one of the few brands of bar soap that floats in water. But when you break the bar of soap into several pieces, there are no large pockets of air inside. If it floats in water and has no pockets of air, it must mean that the soap itself is less dense than water. 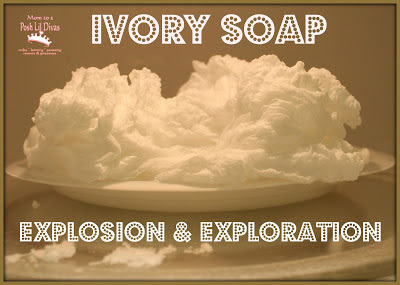 Ivory soap floats because it has air pumped into it during the manufacturing process." Give your microwave a few days. I am really surprised the vinegar didn't work. Ususally I just zap vinegar to get a smell out and it works fine. I did this with my daughters and they too wanted to add water after playing with the clouds. We did, but before we rolled them into snowballs, I added drops of food coloring around the mixture, then we rolled them into "snowballs" and put them on wax paper to dry back out. Viola... We created our very own tie dyed Ivory soap balls. We put them in their bathroom and they loved bath time! I actually came up with that idea on my own! :) I was going to post a pic, but it wouldn't let me. Just tried this. After 1 1/2 minutes smoke started pouring from my microwave. I stopped it and now my entire house is filled with burnt soap smelling smoke and all of our eyes and lungs are burning. We opened everything up and are sitting outside. Anyone know if this is harmful? I'm just wondering if we should seek medical attention. I feel as though the soap is coating my lungs!